Amsterdam is one of the jewels in the Europe capital city crown. 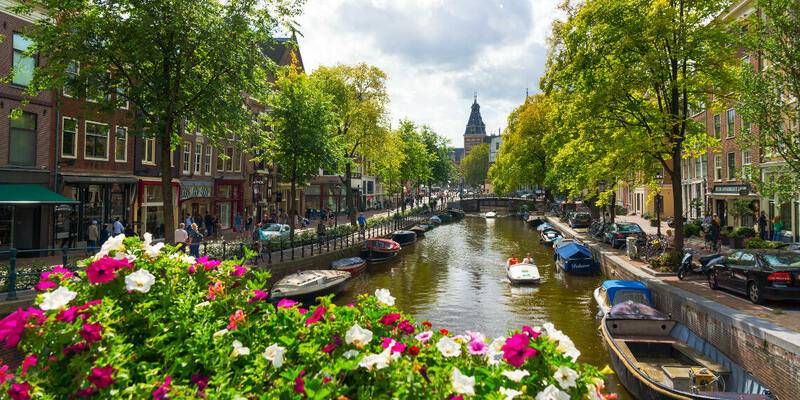 This vibrant city attracts millions of visitors a year who come to the see what the city is famous for; canals, galleries and, yes, coffee shops. Schiphol airport in Amsterdam is just an hour from the UK and is well-serviced by budget airlines which makes the Dam ideal for weekend breaks. If you look at a map of central Amsterdam then you are at risk of getting a headache as the well-planned canals create an oscillating effect on the page. At the heart of the city is Dam Square that you will recognise from pictures of the city and home to some superb hotels. As with any major city, holidaymakers are spoilt for choice when it comes to accommodation. Hotels, hostels, serviced apartments and AirBnB’s offer something for every visitors taste and budget. If you are looking for luxury then the Grand Hotel Krasnapolsky is a very good starting point. When the team at breaks.com visited this hotel, they decided to upgrade to a city view room and it is worth the additional expense to look out on to bustling city from the comfort of the room. Noise was not an issue. Those on a tighter budget should consider the Student Hotel brand that has a number of sites in the city. Contrary to the name, it is not just students who occupy the rooms and the hotel is very accommodating to all visitors. The decoration is fun and young but not childish. All ages will enjoy the snooker, table tennis, bar and restaurant areas. Although not exactly in the centre of the city, you can easily get around using public transport on a pre-paid oyster-style card or walk if it is a sunny day. With so much to do in the city, what are the “musts” on an Amsterdam city break? It would be wrong to start anywhere other than the canals. While it is obligatory to take a picture on a historic canal bridge that has a bike leaning against the side for Instagram, you should also try to go on a boat and navigate the waterways (with an expert at the helm). There are a lot of companies who offer water tours in Amsterdam so you will are advised to do a quick search on TripAdvisor before handing over any money. You should try to go in the early evening to get the best view of the city. The Netherlands has produced some of the most famous artists in the world and has made the country a cultural hub. If you are on the hunt to eye a Rembrandt or Van Gogh masterpiece then head to the museum that takes the name of the one-eared artistic master or the Rijksmuseum that is around the corner. You will find the museums and galleries grouped together around a square and also the popular picture spot of the giant AMSTERDAM letters. If you want to unwind after your cultural outing, the Heineken Factory tour is well worth a visit! Learn about the history and see how the famous beer is made. Of course, you can’t miss out on tasting the result of this Dutch brewing product that is drunk around the world. You can book tickets online and find many sellers on arrival if you don’t want to regiment your agenda in advance. If you are looking to try just one new, local delicacy while in the Netherlands then there is only one valid suggestion: bitterballen and kroketten. These are potato and meat (veggie options available) covered in breadcrumbs and deep friend. Served with a slice of bread and mustard, this simple plate is a staple and a treat for the tastebuds. Amsterdam is an amazing city that can be enjoyed in a couple of days and at just 1 hour away, what are you waiting for?